Less than a year ago, families in San Miguel los Lotes lost everything beneath a cataclysmic downpour of burning ash and rock. Now the survivors of Guatemala’s Fuego volcano eruption are finally beginning to rebuild their lives — and I was blessed to see the progress. On Monday, Jan. 21, I attended a dedication ceremony to bless new homes constructed for the survivors under the leadership of our partners at Friends for Health and Life. I’ve attended events like this in the past. 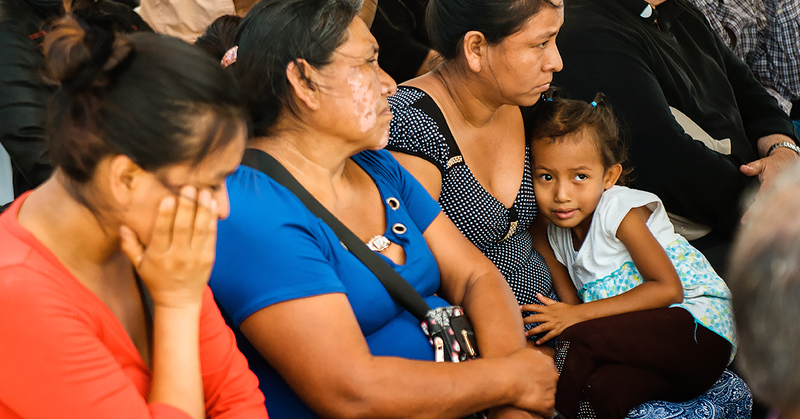 In Nicaragua, for example, I watched our friends at Rainbow Network pray and worship with 22 families who had been dwelling in extreme poverty. At that ceremony, I saw nothing but joy. Every family was leaving behind a dilapidated, leaking house and moving into a new concrete home, and the celebration was lively! But the ceremony in Guatemala was different. There was sincere gratitude, and every recipient repeatedly expressed thanks to God, to Cross Catholic and to the donors who had helped them secure a place to live — but their joy seemed muted. Woven throughout their happiness, I realized, was something else: an underlying grief. This became evident in their words, their tears, and the burn scars that marred their hands and faces. One woman I spoke to had lost 18 family members. Another had lost 35. Life would never be the same without their loved ones. In undertaking this project to rebuild, we knew no amount of material help would ever completely cover the cost of what was stolen from these families on June 3, 2018, but we also knew recovery and restoration wouldn’t be possible without addressing the practical needs these families faced. Even though they grieved, they still needed a permanent place to live, to care for their children and to begin reestablishing a sense of normalcy. That is what the New Jerusalem housing community was intended to provide — not a full replacement for their losses, but a starting point to restore hope and create new life. One of the places where I did see clear evidence of this blessing was in the shining faces of the children who played on their new community’s playground. Their resilience and laughter gave me great hope for the future of their families. Inside their own homes, I knew they would find safety and security. In those homes, I felt they could grow strong again. This was the first time I returned to Guatemala since the weeks immediately following the eruption. After witnessing that much devastation, I feel extremely grateful to have also witnessed these steps toward recovery. The survivors lost so much, and their tears were very real — but so were their smiles and heartfelt prayers. I continue to pray with them that the Lord will give beauty for ashes (Isaiah 61:3).